NICFEC is a neutral and impartial grassroots network of advocates and volunteers supported by an alliance of seven non-governmental organizations which are working together to strengthen and expand democracy in Cambodia. We believe that this goal can only be achieved through free and fair elections, were the rule of law is applied and human rights are recognized and valued. Our core mission therefore is to encourage people to participate in local development and to exercise their democratic rights for making progress in their social lives. We achieve our mission through educating voters, monitoring elections and advocating policy makers. 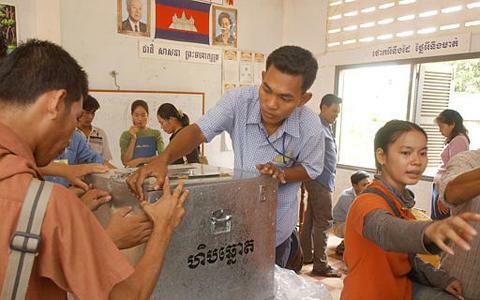 We believe that human rights, decentralization, human resource development and peaceful election processes are necessary preconditions for enhancing Cambodian´s living conditions. We also focus on the gender relation in Cambodia´s Society by conducting special programs to empower women to participate better in politics. For implementing our programs NICFEC has built up a strong network of provincial coordinators in all 24 provinces/municipalities and over 7,000 district coordinators and local volunteers. This makes NICFEC to one of the NGOs with the largest Network in Cambodia. Especially young people are always welcome to volunteer within the programs of NICFEC.